Lying along a beautiful beach strip of the Mediterranean, Tel-Aviv is a busy metropolis, which invigorates its visitors with a unique energetic atmosphere, exotic markets, nonstop active nightlife, golden beaches and restaurants. The city's streets are full of lively sidewalk cafes, elegant restaurants and exclusive shops, along with simple kiosks and local Falafel and Shawarma stalls. Tel-Aviv is also the country's cultural center, a home for a wide variety of museums, galleries, theatres and concert halls. The beautiful white beaches of Tel-Aviv are the city's most popular attraction and a must for any visitor’s itinerary. Restaurants, clubs and entertainment line the renewed promenade, and during warm evenings locals stroll along its length. Another popular site along the beachfront is the marina, which is used as an anchorage by scores of boats and yachts. If you are seeking the Middle Eastern atmosphere, visit the colorful Carmel Market where vendors sell exotic food products and cheap clothing, or go to neighboring Nachalat Binyamin Pedestrian Mall, where artists present their homemade products every Tuesday and Friday. In July 2003, UNESCO, the United Nations Educational, Scientific and Cultural Organization, proclaimed "The White City", the unique urban and historical fabric of Tel Aviv-Jaffa, as a World Cultural Heritage site. 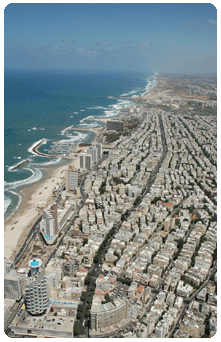 UNESCO recognized the special architectural qualities of the buildings, streets, squares and avenues of Tel Aviv. "The White City", the world's largest grouping of buildings in the International Style, also known as Bauhaus, was planned by the famous Scot, Sir Patrick Geddes. About 4,000 buildings were constructed in this area, beginning in the 1930's until the establishment of the State of Israel. The " White City" is located between Allenby Street in the south, Begin Road and Ibn Gvirol Street in the east, the Yarkon River in the north, and the Mediterranean Sea in the west. The neighboring area of Jaffa was named, according to legend, after Noah's son, Japhet, who built it after the Great Flood. Jaffa existed as a port city 4,000 years ago, serving Egyptian and Phoenician sailors in their sea voyages. Old Jaffa has become one of Israel's major tourist attractions, with artists' quarters, studios and art galleries. Shops for Judaica, archaeology, jewelry and art line its narrow alleys which are named after the signs of the Zodiac. Old Jaffa in itself is a quaint city, more picturesque than ever, with romantic paths and gardens.